In case you missed Part 1, you can find it here! We had known for a while I would deliver the twins via C-section. I had slowly begun mentally preparing myself for what that would involve; however, I still was not ready. I was not ready to deliver them at 34 weeks. I kept telling Trey, “I’m not ready. They aren’t ready. This cannot happen today. They cannot be born today.” He just kept smiling and telling me everything would be alright. I think every nurse in the room had to give me a speech about how well I had done to carry twins to 34 weeks. It didn’t matter what anyone said at that point. I knew 34 weeks was the very beginning of what we had begun to call “the safe zone”. I also knew our babies would be preemies and there was absolutely nothing we could do to prevent it at that moment. Ryker and Averlee were coming even if it wasn’t the most ideal situation. I had less than 45 minutes from the time the nurse told me Dr. Williams had ordered an emergency C-section to the time they were wheeling me down the halls to the operating room. I had no time to think. I had no time to cry. It all happened so fast! As soon as the doors to the OR opened, I looked to my left and saw two bassinets. Two. I remember looking at my nurse and saying, “There’s two. I’m having two babies tonight. Two miracles.” Tears were rolling down my face. I couldn’t decided if I was terrified or if I was overjoyed. Either way, I was ready to meet my babies. 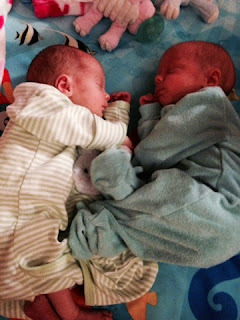 Once they had prepped me for my C-section and started my spinal – because we had NO time for an epidural- they let Trey join me. The room was full of people! I had a team around me. Each bassinet had a team around it. I believe there were two people from the NICU in the room as well. I looked at Trey and told him to pray. I knew there was nothing we could do at this point but pray. So we did. Trey prayed over me as the doctors and nurses pulled, tugged, cut, and pushed on my body. In less than 15 minutes, Dr. Williams said, “I’ll have a baby for you in just a minute, Kari!” He did. Ryker was first. The sound of his sweet little scream was absolutely beautiful. Dr. Williams gave me a quick peek of little Ryker before the nurses and doctors swept him away for his evaluation. One minute later, our precious Averlee was born. Apparently Averlee had tied her umbilical cord in a tight knot. It all made sense at that point. 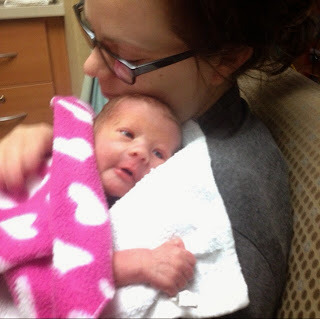 If I had not gone into labor when I did, we would not have known Averlee had umbilical cord problems until she was in distress. By the time we figured out she was in distress, it would have been too late. My grandmother said it best a few days later. She said Ryker was probably saying, “Somebody has to get us out of here! My sister is in trouble!”. 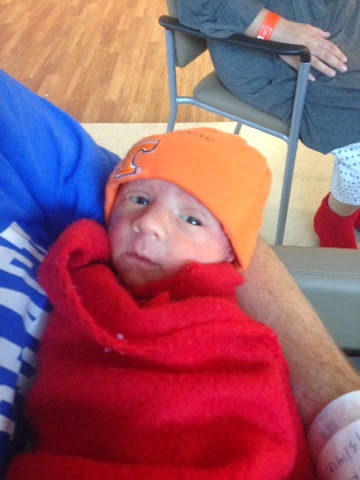 Shortly after Ryker and Averlee were born, Trey was instructed to follow the nurses to the NICU. I wish I had a picture of his proud face. His face was completely lit up. I was laying on the operating table just praying our babies would be ok, and Trey was beaming from ear to ear with pride. It was everything I had ever dreamt of. That moment seeing his face and hearing our little miracles crying in the background was priceless. I hope I never forget how beautiful of a moment that was. 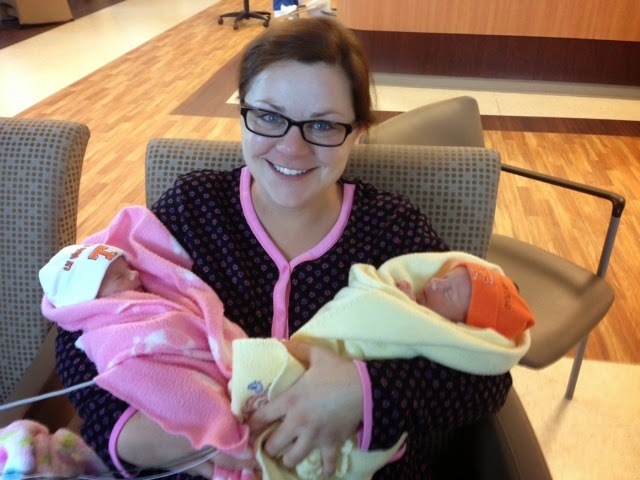 Ryker and Averlee were admitted to the NICU immediately after their birth. We are grateful they did not require any assistance breathing. They did require IV fluids for a few days, phototherapy for jaundice, and a warmer to help them regulate their own body temps. After a couple days, the nurses “coached” Trey and I on how to get the babies to eat. We took it day by day increasing the amount of formula or breast milk in their bottles. It was frustrating at times because we just wanted to feed our babies without having a nurse timing us, but in the greater picture, we knew we were one step closer to taking them home each time they finished their minimal feed amounts. On December 11th, Trey and I left the hospital one last time, but this time we left with our two miracle babies. It was almost like a dream leaving the hospital that day. It almost did not seem real. We were leaving the hospital with OUR babies. These two little lives were in our hands. These two lives we had hoped and prayed for over the last two and a half years were now in our hands for us to take home. I could not thank God enough. I was in constant prayer the entire ride home. 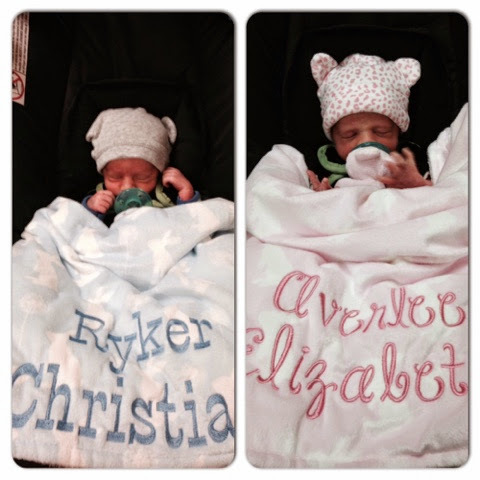 Tomorrow Ryker and Averlee will be 3 weeks old. They were worth the wait. Looking into their sweet little faces makes every single failed treatment cycle, negative pregnancy test, heartbreaking test result, set back, roadblock, cancelled cycle, doctor visit, crying fit on the bathroom floor, surgery, blood draw, and injection in the abdomen worth it. They are worth it. I’m not sure where this blog will go from this point forward, but I hope I’m able to continue documenting this wonderful journey. I hope each and every one of you have a very Merry Christmas. On Tuesday afternoon, I began tracking contractions. I was having them about 12-15 minutes apart. They weren’t awful. They were about as intense as the BH contractions I had been having for almost 10 weeks. As I mentioned in a previous post, I had already spent two nights in the hospital at 30 weeks due to threatened pre-term labor. During that hospital stay I was given two steroid injections to aid the babies’ development along with magnesium sulfate to slow/ stop my contractions. Basically, I was tracking contractions on Tuesday but I didn’t think anything about it because I felt fetal movement. As far as I knew, I had not lost my mucus plug and I did not have any bleeding. I assumed I was just having practice contractions. No big deal. Tuesday night I slept all night long. Seriously. I only woke up once to pee. That’s a huge deal when you have two tiny humans pressing on your bladder constantly. I woke up Wednesday, took Gavin to school, came home and just laid around until it was time to get ready for my weekly doctor visit. Trey was off work on Wednesday so he could run a few errands before our doctor appointment. When we were getting ready to leave the house, I told Trey I thought I would throw my hospital bag in the car just in case. I asked him if he wanted to put a bag in the car too. He said would just come get his stuff if he needed it. I was thinking we might have another over night stay in the hospital in our near future…. little did I know. We had an ultrasound at 2:00 and a doctor appointment at 3:40. During our ultrasound, I was extremely uncomfortable. I’ve never wanted to rush through any of my bazillion ultrasounds, but I was completely over this one. 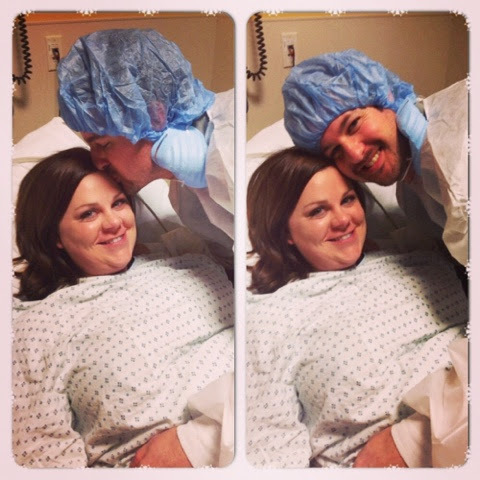 I kept having contractions, which led to me having to roll over on my side off of my back. 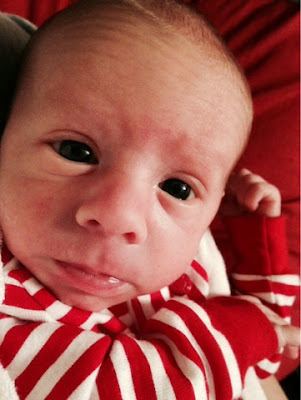 The tech told me Baby A – Ryker- was “very low”. She also said Baby B – Averlee- was head down. I knew at this point that our days were numbered… little did I know. When my nurse called my name to go back for my doctor appointment, I asked her if we would be doing a NST. I told her I was having frequent contractions. She said my doctor hadn’t ordered one, but she would talk to my doctor and see what he said. When my doctor came in, he did not ask a lot of questions. He told us he was going to send us over to L&D to be checked and hooked up to the monitors. He told us we would probably go home that night, but we just needed to be checked out. So off we went to L&D. We made a few quick phone calls and sent a few texts, but we did not see any reason for everyone to rush to the hospital…little did I know. The time between the moment we got off the elevator on the 3rd floor of the hosptial and the time the twins were born was a complete whirlwind! When I was checked, the nurse started to prepare us mentally that we would be delivering soon. I was already at 5cm and the contractions were becoming stronger and more frequent. 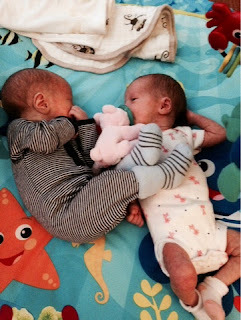 Ryker and Averlee were on their way and there was absolutely NO time to waste. Before we could even make a phone call to our parents and close friends, I had a room full of nurses trying to start my IV, draw blood for labs, and prep me for an emergency C-section. . .